Whether you grow up in a house full of extravagance and wealth or you live in dire poverty, money is the one thing that everyone is ashamed of. You are ashamed if you have too much, so you try to give it away to charity. You are ashamed if you live paycheck to paycheck and carry too much debt, so you try to cover up the evidence. Money (or the lack thereof) is the only dirty little secret left in America. Sure, we can talk about your erectile dysfunction, or your hemorrhoids, even your lack of bladder control, but how willing would you (or anyone you know, for that matter) be to divulge your load of personal debt or the amount of money that you have stashed away in that savings account? 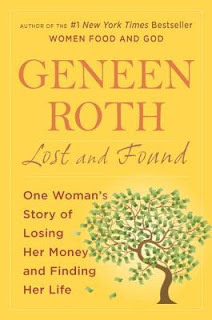 Geneen Roth struggled for years with her personal demons as she battled (and won) against eating disorders. She wrote books, went on Oprah, and invested her earnings with someone she thought was as good at finances as she was at writing. That someone was Bernie Madoff and like all of his other victims, she and her husband were shammed out of over one million dollars. Lost and Found, her latest novel, follows her journey as she uncovers her feelings around money and exposes the shame that Americans have long placed on finances. Overnight she had to go from the type of woman who could easily throw $400 dollars at a pair of ugly glasses that she may never wear or make $100 satellite phone calls to her husband in Antarctica to being part of the masses that worry over mortgage payments and where the money would come from to pay for that phone call. 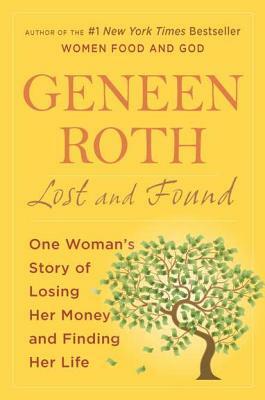 It was during this time that Roth learned that she dealt with her feelings about money much the same way that she had always dealt with food. The amount of guilt that she has always had for having so much and the feeling that she never quite had enough caused her to never really deal with money at all, preferring instead to sign all of her checks over to anyone willing to deal with the messiness rather than having her hands dirtied by having to learn about it. It took awhile for me to get into this book, so while it was a quick and interesting read, I ha a hard time really identifying with someone that had thrown a million dollars out the window. Once I finally got my self to sit down and actually read what she was saying, I have to agree that confronting our feelings around money and actually voicing those distorted views to others may be the way to overcome the shame (and eventually the ignorance) that Americans have built around our personal finances. I’ll be discussing this book with the BlogHer Book Club over the next four weeks. Come join me. This is a paid review for the BlogHer Book Club, the opinions expressed are my own.